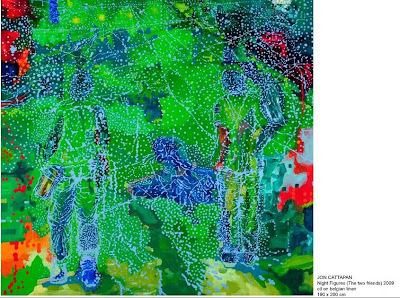 The eerie beauty of Jon Cattapan's work surges with life and energy. His exhibition at Kaliman Gallery (which I'm woefully late in reviewing) is one of the more engaging, relevant and lush shows of new painting I've seen this year. The works on show stem from a commission by the Australian War Memorial that saw him join the Australian peacekeeping force in East Timor. It's a great testament to the work that it stands strong even without the knowledge of that context. 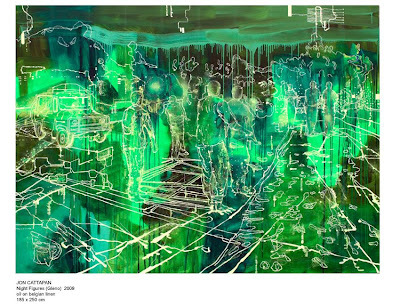 The works on show are a combination of sketches and large scale painted works, the show, entitled 'Night Visions' is in a palette of greens, clearly a reference to night vision imaging goggles but so rich and varied that at times one might be in a rainforest or on an ocean floor. 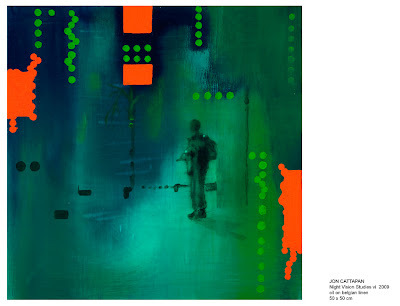 The green swathes isolate figures, they remove all sense of conventional linear perspective and leave the sense that the protagonists are adrift in space and time. Cattapan has an interesting technique, he creates these lush backgrounds that teeter between the synthetic and the primal and then applies sketched outlines of figures to them in a process close to monoprinting on canvass, this gives for images that seem spontaneous as they benefit from the serendipities that come about as paint and paper are applied and peeled off. 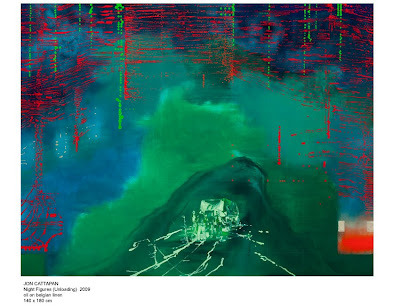 This is just a part of an accretion of layers, he adds blurs that might be radio signals and lines and pulses that could be everything from contour lines to synoptic charts. Cattapan somehow manages to create a sense of the aether of the modern world, his canvasses buzz and hum with colour, they almost appear to vibrate. In 'Night Figures (Unloading)' a truck is almost insignificant in the foreground, sitting in the mouth of a mountain pass or perhaps just in a valley of night. Around it are the orange static crackles of data, it is under surveillance if not actually under threat. This sense of foreboding that Cattapan creates is powerful in that it doesn't purely rely on the night goggle idea. The layers of data, the hidden waves of communication, speak very directly to our modern condition, we are never quite alone, recreated and reformed somewhere in bits and bytes and pixels. 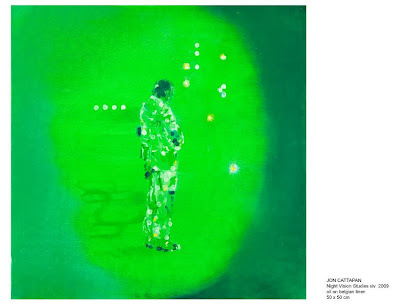 In 'Night Figures (Gleno)' Cattapan is at his best, this might be a crossroads or a history painting. Figures pass, coming into the plane of the picture from over our shoulder, there are pairs of people and although they never quite interact explicitly they seem to merge. In the centre of the frame, slightly to the left we are drawn to a figure who might be naturalistic or might be bound, it looks a little like a classical statue, or perhaps like Christ at his flagellation or crowning with thorns. The picture manages to be a live and unsettling but also quite beautiful. There is a tendency to monumentalism in much painting today, whilst none of these works quite beat us over the head with their scale it is in the larger works where Cattapan is most effective. The vista of the canvass is there to show the breadth of our field of vision, his sizing up or down of figures in a kind of shifting perspective gives us a sense of the flighty nature of perception this might be our world as we see it rather than as we photograph it. In 'Night Figures (The two friends)' the characters, casually observed with their backs to the viewer, become mythic in what might be a star map, it's this mixture of intimacy and scope that is so powerful. For all its abstractions and complexity Cattapan's is a deeply human art. He achieves something rare by presenting the otherness and isolation of our bodies but still retaining a sense, and at its best a palpable need, for connection. At times his images might remind us of some of the more outré branches of quantum physics, where space holds a memory of the presence of people. At others his subjects, sometimes composed of little more than dots in a blurred digital landscape, seem to hold themselves together, coalesce their images, by sheer force of self. It's a beautiful achievement, it reminds us of the fragility of our flesh and the essential power of our spirit.